WILLEMSTAD – The situation surrounding the elderly care is in peril. This is because of the government’s decision not to subsidize meals for the elderly anymore. The government has also decided to stop the nursing home Birgen di Rosario from taking more patients. This was the reason for the union, representing the health care sector CBV, to call all employees from the Wit Gele Kruis and Birgen di Rosario for an urgent meeting on this matter. The CBV leader, Coromoto Maria, has indicated how depressing this situation is where one can actually talk about measures to destroy the nursing home Birgen di Rosario and the care institution Wit Gele Kruis. “This measure will send a lot of our employees home, leaving them without a job,” Maria said. “The reason is because the government decided to cut in the funding for the nursing home, which is part of the care institution Wit Gele Kruis,” Maria declared. 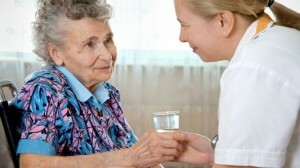 “The government has declared that they will not subsidize the care for the elderly in their homes. This means that about 110 people will be left without care. This also means that we will have to close a department which has 40 employees. About 100 to 150 elderly will be left without their daily meal if we close this department,” Maria explained. The union leader indicated that they have met with the Minister of Labor and Social Affairs, Jean-Marie Francisca to explain these new developments and the Minister understood these issues and said that she will present them to the Council of Ministers to see how the government will find funding for this institution. “It has been 2 to 3 months now and the Minister has not done what she was suppose to do and the employees’ contracts are about to expire. There is no guarantee from the government for the subsidy. It’s time for the government to give these people some kind of guarantee,” Maria said. Maria also indicated that the union has been working on a debt the government has with the nursing home of about one million guilders. “Finally, they have received the money, but the government has put restrictions and rules for the use of it, which makes it almost impossible for the nursing home to hire more staff or to care for more elderly,” Maria said. CBV indicated that the government cannot take these measures without first analyzing the consequences. “Once again, the government is taking measures which go directly against our elderly,” Maria concluded.